Sometimes we get clogged with excess energy by constantly healing our clients, friends and ourselves. There are times we feel our Reiki flow has reduced or is not as charged as it used to be. You need to recharge your Reiki batteries! You need to drain out excess energy and clear yourself as a channel. 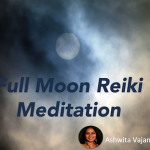 Reiki connects us to the source, and the moon is a powerful celestial body of the source. And you can use this heavenly body of energy to recharge your Reiki batteries. 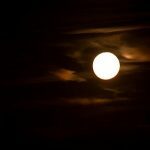 There are 2 kinds of moon rituals you can do, New Moon and Full Moon rituals. You need to note the time and day of the respective moon phases. This information is freely available online. New Moon is for new beginnings, manifesting wishes, transformation and attracting money or love into your life. Full Moon is for releasing negativity, bad karma, bad relationships / situations, weight loss, money problems, anything that is no longer serving you. Do these rituals for short term wishes up to 3 months not longer, as you can do this every month. Use candles, incense and clear quartz crystals for these rituals. Use a small white candle and a quartz, there is no need to elaborate. Firstly, make intention slips, just like the ones you use in your Reiki box. Draw the symbols on the back and in the air around you. This will protect and ground you. Sit or stand near the moonlight, either out of the house or in some open place in your house from where you can see the moonlight. Breathe in the moonlight. This will clear your aura, chakras and make a connection with the moon. Most of you are energy sensitive, so making a connection will not be a problem. Use the distance symbol if you like to connect with the New / Full Moon. Read your wishes directly to the moon by saying “I wish to manifest these by the next month and I will come back again for more wishes. Thank you, thank you.” Burn the slips. Dear Ananya, i going thru a strange emotional condition oflate. I am married but due to certian reasons have developed an irrepairable mental disconnect wit hubby, our relations are still harmoinious (universal love kinds). Mine is a love marriage and could marry after a prolonged resistence n opposition from parents. during my struggle for my marraige i met a fellow colleague and felt a strong mutual attraction. though there was nothing verbal between us. then i got married to my love and its been 13 yrs together. for the last 2-3 yrs I m feeling a stong pull towards that ex colleague of mine whom i have not met for around 10yrs. i feel like meeting him once. i try to heal this mental condition but it keeps coming on surface every now and then. I dont know how to deal with it. I m a second degree reiki practitioner. kindly guide. :). thanks Prerna!! quite an insight. appreciate your effort n time for me. this i think will help me. mail me at brahma_naad@yahoo.com. we can be good freinds perhaps. Thanks Ananya!! Jyotie IM glad u found my humble advice helpful….!! Ananya is a great healer n a very warm person to know. Good times ahead for u!!! Do not end your marriage. Not now. Nothing is irrepairable. Your marriage has good energy. Live in the now and your path will be laid out for you. Trust. Heal yourself through Reiki, try to find solace in your heart..
Stay blessed.. good luck, love,light and peace to u.
thank you Uj G. that is so comforting. i m on my journey. learning and growing…. thanks to your poeple for guiding and your love. I hope you are emotionally stable by now. Since you have mentioned about completing 2nd degree, you can try to use Hosanna symbol along with Hon Sha Za Sho Nen and pray Archangel Michael to cut the aetheric cords (negativity) between you and your husband. Do let us know if it helped you.. I am sure it will. Hello, this is my first time today to read your articles. you are awesome!! Thank you Raunak! i will definitely try what u hv told. I want to overcome this karmic pattern and thats why sought help. Thanks to u all channels for your valuable time and advices. may reiki guide me and sail me thru. Hi, could you please clarify when exactly do the rituals. You write- around New moon, and around Full moon. So, is it on a first day of New/Full moon, or before (around)?. I am not completely sure I understood this from the article. Thank you! Very good advice, will do it today (second day of the Full moon). Wow, just tried what you suggested. Thanks for all your fun information. Thank you Ananya for the article. You mentioned that the ritual for wishes should be for no more than 3 months. What is the significance of the 3 months? May your journey be with love, light and Peace. On another note…..I enjoy these informative reiki posts. Thank u!!! hi, i want to my weight but im unable pls help me.i would like to know if someone do reiki she must be a vegetarian? Thanks for a nice guidance.Since i was down with very high fever on new moon day hence i missed to follow the process you mentioned of writing and reading my wishes. Please recommend how else i can compensate as i missed this opportunity due to my ill health. I became a Reiki Master a year ago in Los Angeles, California. I just wanted to thank you for all your posts! They are so insightful and very useful ! This is very useful article, written short & simple to follow. I will use this for Best of Good to achieve. I really enjoy the helpful tips and insight you provide on your blog. 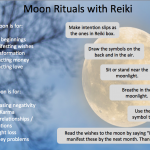 The moon ritual stuff is unlike most other reiki sites I read and is in alignment with the interests I enjoy learning about. I also like your style of writing and when I connected to your photo it made me smile. I am just now developing my website (which isn’t launched yet but plan to link to you in the near future). Best of luck and abundance to you. Thank you for the great work you do. Hi you can write as many wishes as you want, just read and burn them. Once a wish is over, no need to use it for the next time. “Coming back for more” means the next New or Full Moon. Hi !! 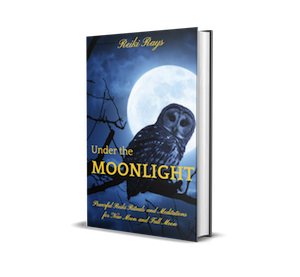 your article about new moon & full moon rituals is quite informative. I have only one doubt. On new moon day there is no moon in the sky. During the daytime, it travels all along the sun. In that case how to breath the moon light? I was always told that the new waning moon cycle was for getting rid of the negative, removing what you no longer want in your life. and the Full moon waxing moon cycle was for attracting to you what you want. Money prosperity good health and so on. this was told to me by some one who is wiccan. Hello mam, I need ur guide to heal one situation, my husband is working in one plant n this plant is soon going to close n he will be jobless, I m healing this from last three months but not getting the results, I m level II healer. Situation changes but there r many blockages n negatity.. how to heal??? My boyfriend is very sensitive to the full moon. When we had that full moon with the eclipse he had a bad anxiety attack at almost the exact time the full moon was at its peak. He often has some anxiety or is high strung during the regular full moons. Any suggestions or info on what might being going on? He is a Cancer which is a water sign but so am I and I don’t seem to be affected so any tips would be nice. Thank you! Thanks for the ritual in moonlight. It so helpful. Also important to remove negetive energy. I have many question about chakra. May you help me?